chrissomerville on Re-opening a week today! Debs and Wayne on Re-opening a week today! Days of summery weather are still with us, but cold days as well. But Autumn is on its way and I’m busy getting ready for my October Half Term Season at the Harlequin. This year I am presenting an unusual story written a long time ago, and set in China. It is a fantastic story about a Willow Tree who falls in love with a Princess and her father, The Mandarin, who won’t allow anything to be planted in his garden except gooseberries, yet he craves a banana, a fruit he has never tasted! It is a story which I tell the children has a Happy-Sad ending, and they seem to know what I mean. 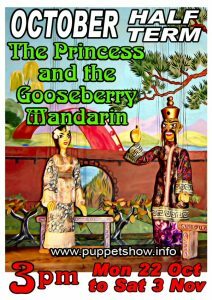 It is beautifully written by Grace Dorcas Ruthenburgh and was Eric Bramall’s favourite puppet play. Eric Bramall was the man who built the Harlequin Puppet Theatre and who taught me how to work puppets. He died in 1996, but he will be glad that I am still managing to do this story. When he was alive we had three puppeteers to perform this play, now I have to do it alone. Hope to see some of you during the holiday, October 22nd to November 3rd.